Blending tradition with innovation, the S.S. Badger is the fun and relaxing shortcut across Lake Michigan--a spring, summer and fall treat for the entire family. The four-hour, 60-mile cruise between Ludington and Manitowoc, Wisconsin has all the comforts of home and more. The 410' S.S. Badger carries up to 620 passengers and 180 cars, tour buses, RVs, and semi-trucks. Experience Amazing! This Big Cruise Ship Offers Great Travel Fun! Passengers will find spacious outside decks for walking or lounging, free movies and satellite TV, live entertainment, two restaurants, full cocktail service, shopping and staterooms for relaxing or sleeping during the cruise. Activities for kids include a video arcade, coloring contests, and kids' playroom. 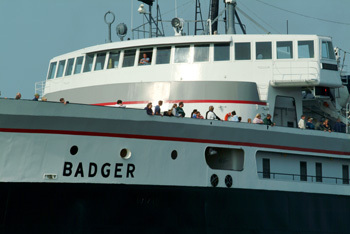 During the fall, passengers can sleep on the Badger in a stateroom while the ship is at the dock in Ludington. A trip on the S.S. Badger carferry is a vacation within itself! No matter which way you are crossing the lake there are restaurants and shops within walking distance of the dock. You can even set sail from Ludington in the morning, and sail back in the evening! Remember when you're on board the Badger, there's plenty to keep you busy, and staterooms are available. Many lodging facilities in both Ludington and Manitowoc offer free shuttle service to and from the carferry docks for those who choose to spend the night. It's a fun and very affordable mini-vacation for your entire family. The S.S. Badger's home port is in Ludington, Michigan, at about the halfway point between the northern and southern tips of Lake Michigan. Ludington is a top vacation destination in Michigan...due to the miles of beautiful beaches, first class fishing and the Ludington State Park. The S.S. Badger docks just a few short blocks from Ludington's vibrant downtown, filled with great shops, restaurants and galleries...or visit one of our historic lighthouses. Ludington has plenty of lodging facilities, from hotels/motels and resorts to charming bed & breakfasts. Any time of year, there's a fun event happening in the area, guaranteeing fun for the entire family. Across Lake Michigan, the carferry dock is in Manitowoc, Wisconsin. 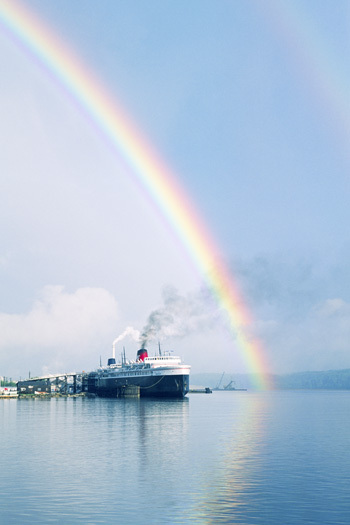 The S.S. Badger carferry travels across Lake Michigan between Manitowoc, Wisconsin and Ludington, Michigan once daily during the spring and fall seasons. Once summer is underway, the Badger makes two round-trip crossings daily. During the overnight crossing, passengers can enjoy sleeping in a stateroom aboard the ship. Staterooms are available by reservation during each sailing. The number of staterooms is limited, so reserve early. Crossing time from Manitowoc to Ludington is 4 hours. *Leaves at 5pm on June 1. **No 8:45pm crossing on July 4, July 24, and August 14. ***No 1:30am crossings on July 5, July 25, and August 15. If you don't have the need to cross Lake Michigan, but still want to experience a cruise aboard the S.S. Badger, start small and take a Shoreline Cruise! Six of these fun excursions are planned for the summer of 2018, each one lasting two hours. It's time to join in the festivities and celebrate this grand ship. Read our story about the Shoreline Cruises.